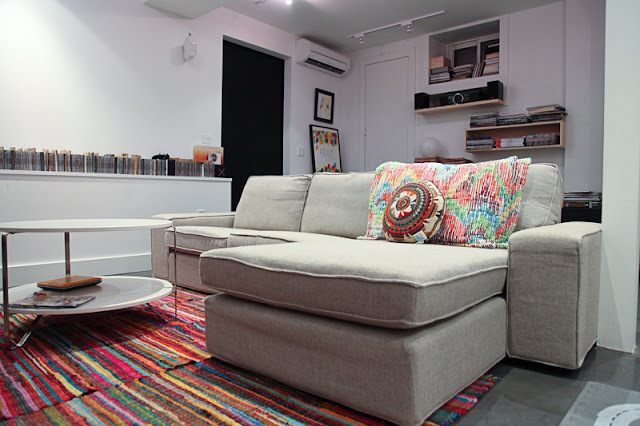 8FOOTSIX: Urban Outfitting the basement! Actually, we have 3 rugs! I love them!!! It reminds me of this photo from our trip to Hay Home. Adding colourful pillows was great advice! Of course, I am still using standard size bed pillows since they are way more comfortable for lounging around than throw pillows. Actually, we have two extra 20 x 20 throw pillows in the linen closet upstairs, do you think I should add them into the mix? Thanks for your feedback yesterday! pps. The blue and off white rug is very scratchy. These rugs are super soft! Could you use Velcro to attach them together so they can still be washed? amazzzzing ...love the technicolour! so cheery and fun ...and I love blogs that tell me 'how much'!!!!! it really warms up the space ... lovely ... where did you get it? Hi Sharon! Everything was from Urban Outfitters! I put the baby to bed tonight and took off to the store! I love how it looks but how do you keep those rugs from sliding around? I used to have one of those UO rugs and could never keep it in place! 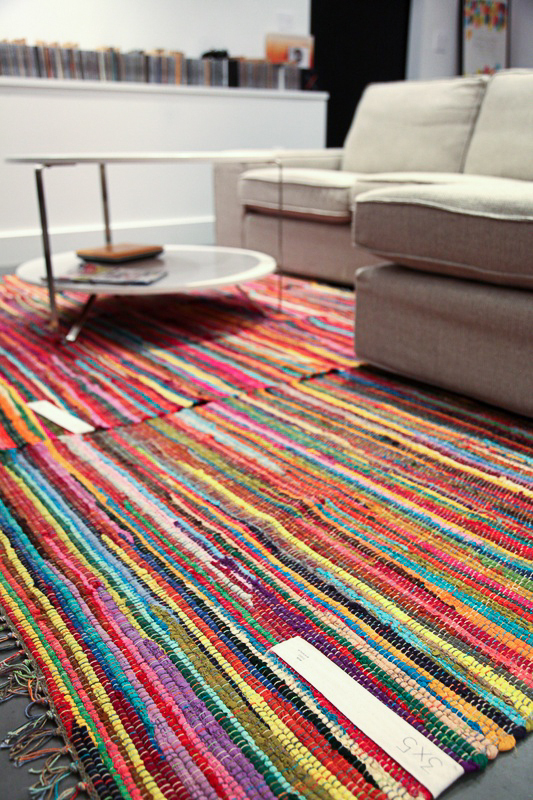 LOVE these rugs! They're colourful and bright and fresh looking! And I'd leave them un-sewn, unless they end up sliding around.....easier to wash! Love the colour and Michelle's idea about the velcro is a great one! so cute! my first thought was attach them or you will go crazy. Any sort of button, velco, or whatever solution seems like the best idea because of the washing aspect. Even though I tend to hate rug pads because they are one more thing I often want to clean and fuss with, I would get one for under this because I think it would add to the "integrity" of the rug... if that makes sense at all. 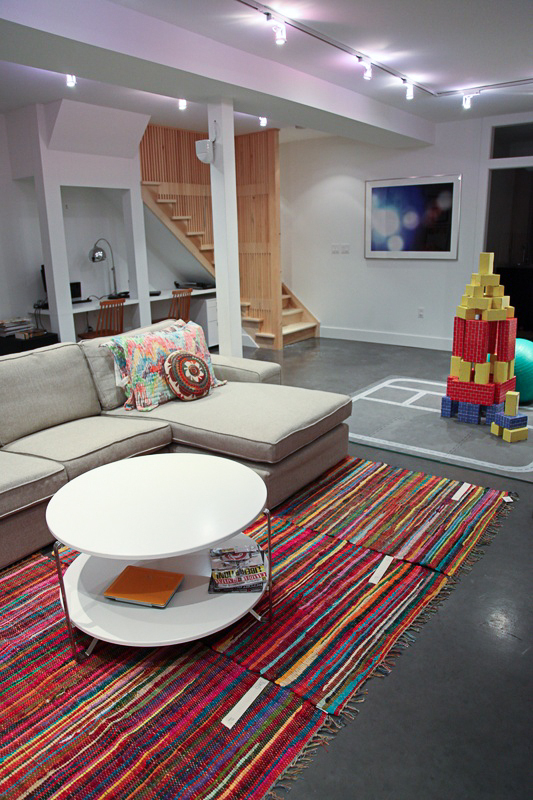 Anyway, this is awesome for kids, fabulous for colour, and you killed the budget portion of this small basement makeover! I'm impressed. It was a 4am decision....you know? It came to me when I was trying to go back to sleep after being up with the baby. Thanks! I was surprised how great colour looked! Crazy colour is never my first choice, but totally wins the day! Once we get a rug pad, we will see what kind of modifications need to be made!! Washing is key with little ones! Rug pad!!! I want a rug pad to keep them in place, and also to cushion the fall when the boys knock each other off the couch...ok, a 2mm cushion isn't really going to help...but it gives me some peace of mind! Color is exactly what you needed down there to warm up the concrete and infuse the play area with energy. Thumbs up. 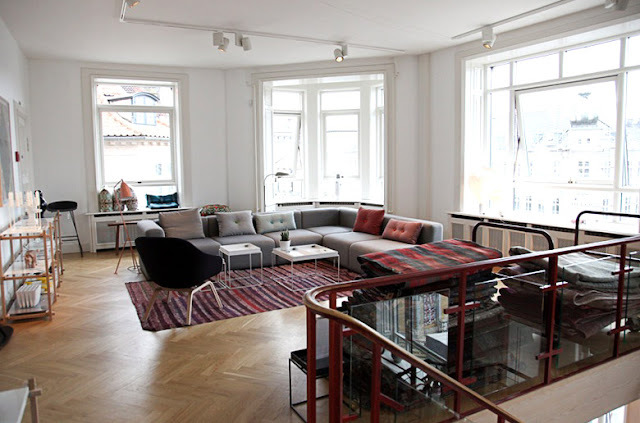 love the rug(s)! perfect solution to not "decorating" the basement.